If you’re looking for Easy Halloween Craft Ideas, these tutorials will have you ready for Halloween in no time! Halloween is such a fun time for kids and adults alike. With so many costume parties to attend and lots of trick or treating opportunities for kids, there are so many ways for everyone to enjoy this holiday. If you want to make this Halloween extra special, then you have to go all out when it comes to decorating your home! Need inspiration on how to create boo-tiful Halloween decorations and delicious halloween treats? Check out these epic Halloween Crafts! 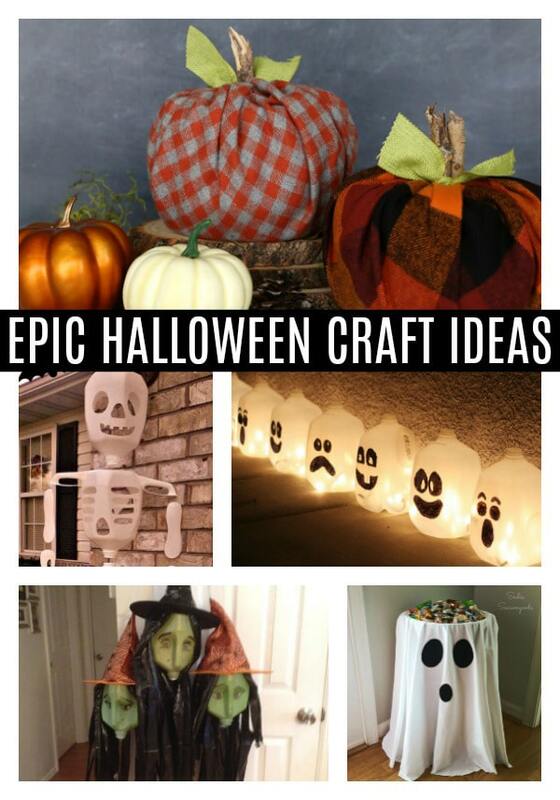 Epic Halloween Craft Idea #1: Let’s start off easy! 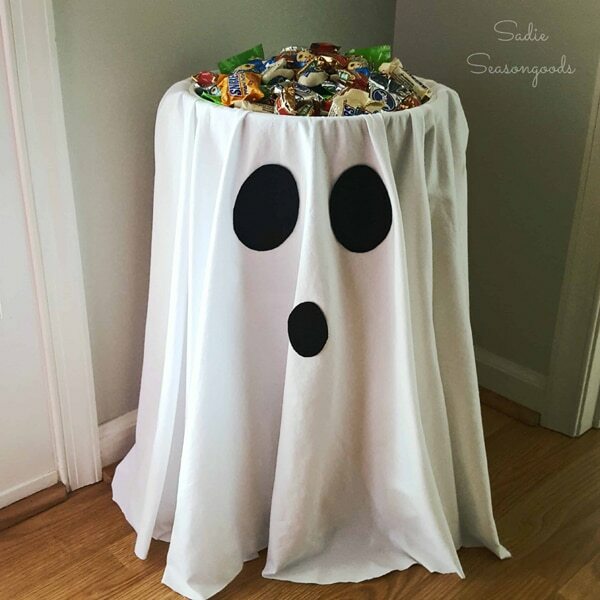 This Easy DIY Ghost Candy Bowl Table is a super cute decoration that anyone can do. This candy bowl table is made from upcycled materials, so if you have similar stuff lying around at home, you should definitely try making it yourself! Epic Halloween Craft Idea #2: Want longer-lasting pumpkin decorations for halloween? Check out these sweet Toilet Paper Pumpkins! Toilet paper pumpkins have been around for a long time, and they are some of the easiest halloween crafts to do. 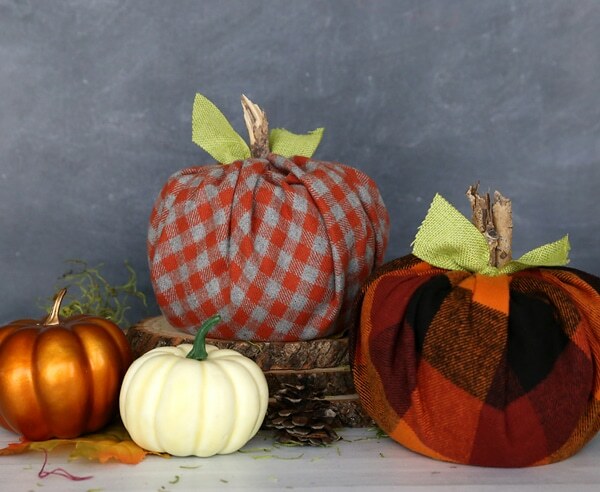 To make these adorable toilet paper pumpkins, you will need a bunch of toilet paper rolls, some cute fall colored fabric, and something to use as stalks. 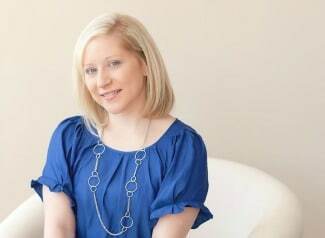 It’s an easy enough project for all members of the family to take part in! Epic Halloween Craft Idea #3: How about a sassy sign for your Halloween party? 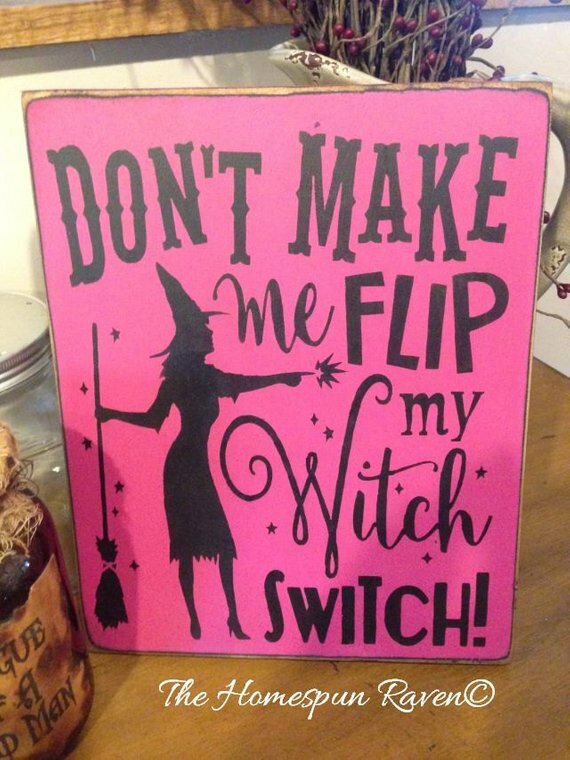 This Halloween Witch Sign is a cute reminder for all the naughty trick or treaters or party guests to behave! This particular sign is hand painted on wood, so if you’re feeling a little crafty, you can buy some wood planks, some stencils, and some paint to make these signs yourself! 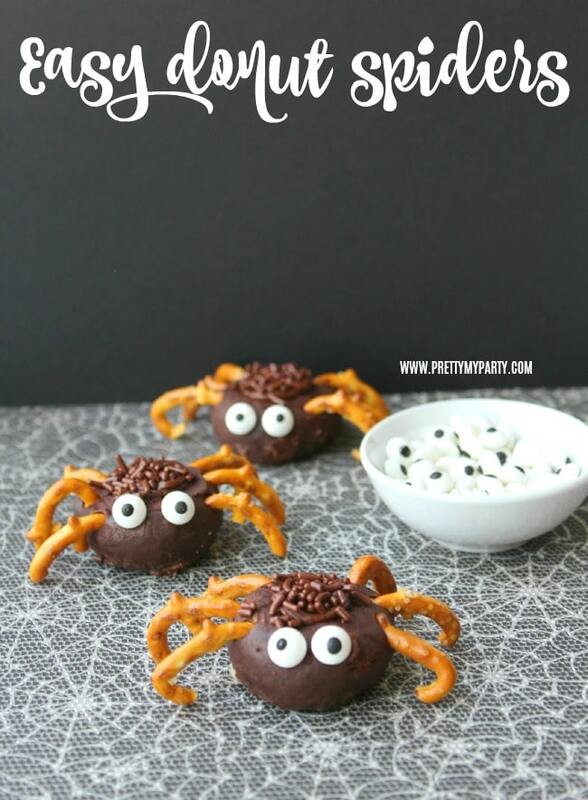 Epic Halloween Craft Idea #4: How cute are these Easy Mini Chocolate Donut Spiders? These darling creepy crawlies will look amazing on that dessert table at your Halloween party. Whether you’re hosting a kids or adults Halloween party, your party guests will definitely love these deliciously spooky doughnuts. Epic Halloween Craft Idea #5: Boo! 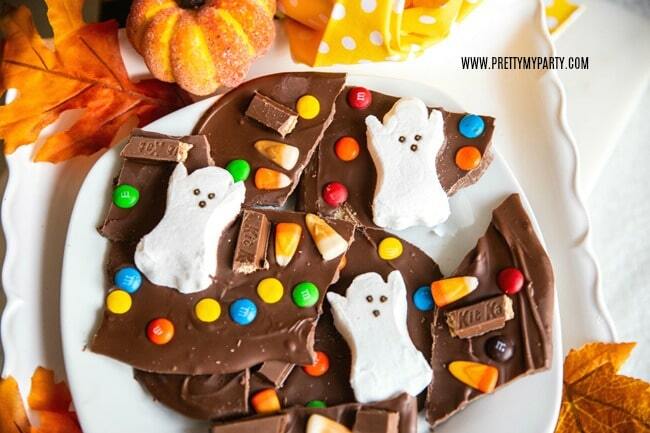 These yummy Halloween Boo Bark treats are going to be a huge hit at your Halloween party! If you’ve got plenty of leftover candy lying around, making this super easy candy bar recipe will be an excellent idea. 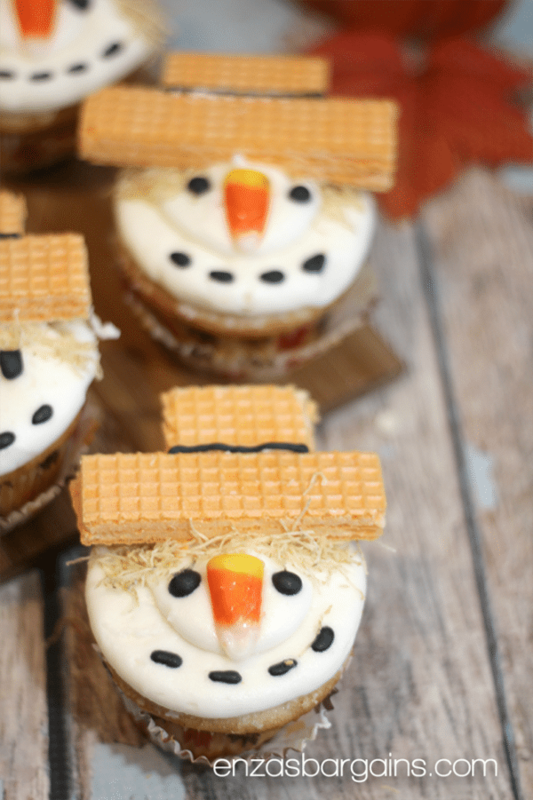 You can even rope in the kids when making these delicious treats! Epic Halloween Craft Idea #6: Wow! Who would have guessed that this sinister-looking vase was created using stuff bought from the Dollar Store? 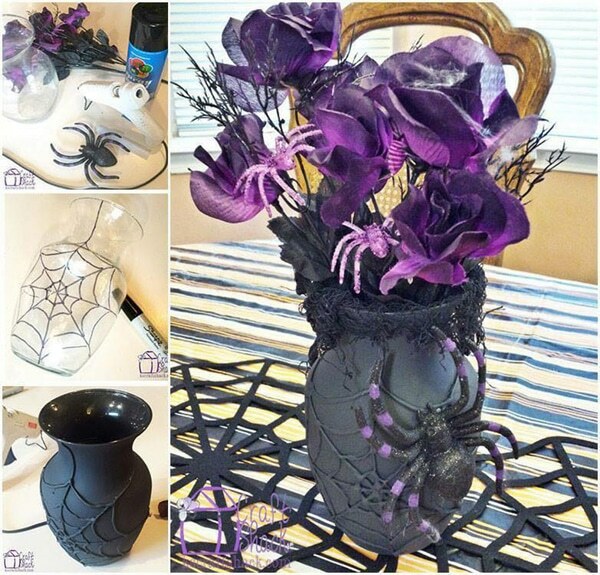 If you’re looking for cheap but creative Halloween crafts, raid your local Dollar Store and look for materials to replicate this Dollar Store Halloween Spider Vase! You’ll get yourself a very cool looking vase with just a few bucks and a dose of creativity! Epic Halloween Craft Idea #7: Here’s another Dollar Store Halloween DIY idea for the thrifty crafters out there. 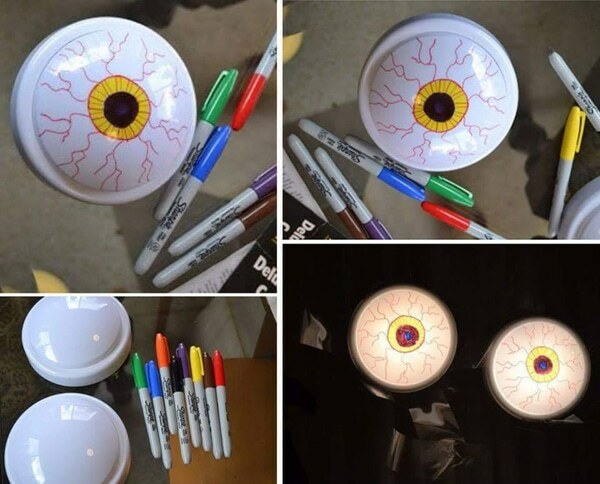 These Dollar Store DIY Glowing Eyes will definitely scare off any ghouls and ghosts from your home come Halloween! 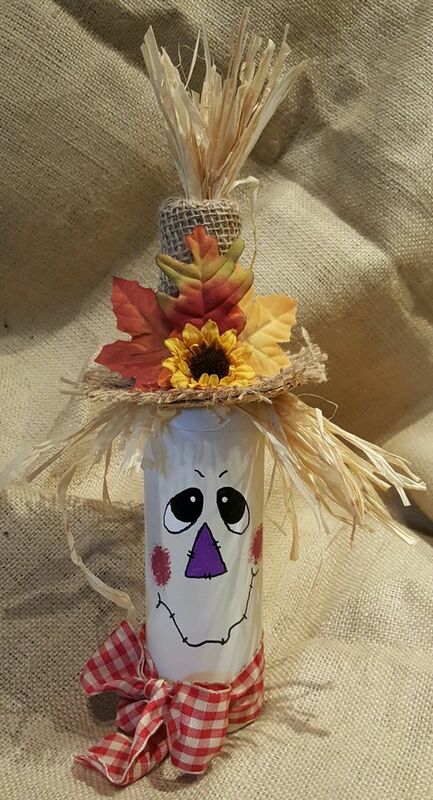 Epic Halloween Craft Idea #8: How cute is this Scarecrow Wine Bottle Craft? If you’ve got plenty of wine and other liquor bottles lying around, give them a Halloween makeover with a straw hat and some fall-themed clothes. Put these adorable scarecrow wine bottles on your mantelpiece or on your porch to welcome trick or treaters. Epic Halloween Craft Idea #9: Here is some more scarecrow cuteness! These Scarecrow Cupcakes make for a delicious treat for trick or treaters or for party guests at your Halloween party. These yummy cupcakes almost look too good to eat! These cupcakes follow a basic vanilla cupcake recipe, so if you already have your own cupcake recipe, this Halloween craft idea will literally be a piece of cake! 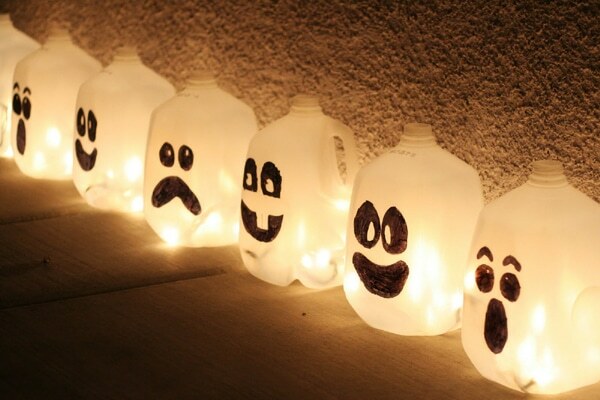 Epic Halloween Craft Idea #10: These Lighted Spirit Jugs are so cute and creative! The best part is that you can make them yourself using only four materials! To make these lighted spirit jugs, you’ll need several clean gallon milk jugs, a black marker, a craft knife, and a string of white low-wattage string lights to give them that eerie glow! Have the whole family join in the fun by letting them draw a face on their own milk jugs! What a great alternative to carving pumpkins! Epic Halloween Craft Idea #11: Who knew milk jugs are such useful Halloween craft materials? Here’s another milk jug Halloween craft idea for you: Witch Milk Jug Halloween Decorations. 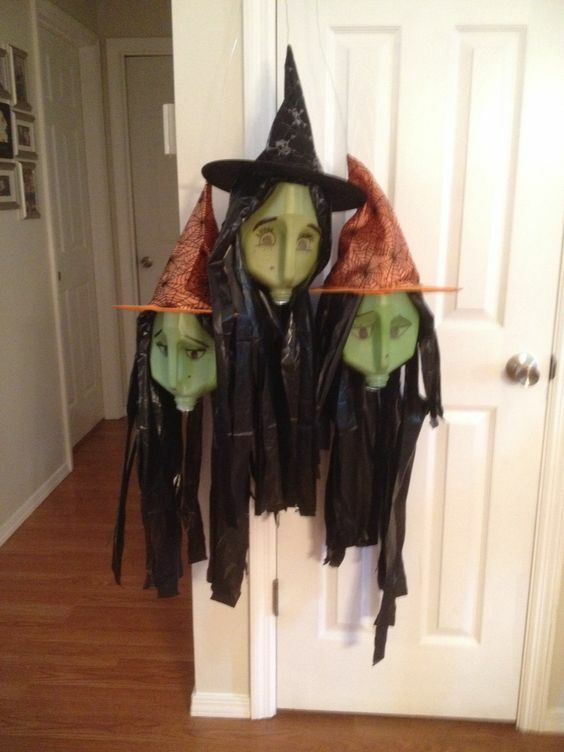 To make the milk jugs look like scary little witches, paint them with green craft paint, draw faces using a Sharpie and hang them upside down. The dollar store witch hats and black trash bag hair complete the whole look! 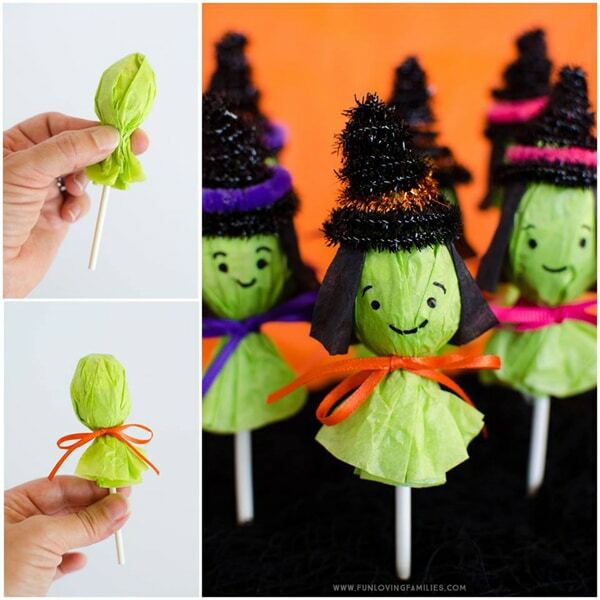 Epic Halloween Craft Idea #12: All the guests at your Halloween party are going to love these little DIY Lollipop Witches! With how adorable they look, you will be pleasantly surprised at how easy they are to make! These bewitching sweets are made using store-bought lollipops, green tissue paper, black tissue paper for the hair, some colorful ribbons, and of course, the secret to those fuzzy black hats: pipe cleaners aka chenille stems or tinsel stems! Epic Halloween Craft Idea #13: Having a large skeleton to greet party goers or trick or treaters at your house this Halloween seems like a cool idea, but those fake skeletons can be pretty expensive! If you want to save your dollar but still want an epic skeleton to decorate your house, you’re going to love this DIY Milk Jug Skeleton! To recreate this amazing milk jug skeleton, you will need about seven to eight milk jugs. Be sure to clean them up and dry them properly! The other materials for making these are pretty easy to find as well: a fishing line or string to connect the bones, a craft knife and scissors, and a felt tip pen. Sounds like a fun way to spend an afternoon right? Which of these 13 epic Halloween craft ideas do you want to try doing yourself? Do you have any cool halloween craft ideas to share? Let us know all about them in the comments below!